One of the many places I've not visited in the White Mountains of NH is the site of the plane crash that occurred near the summit of Mt. Success in the late morning hours of November 30th, 1954. Once upon a time, there were regularly scheduled commercial flights between small cites in the U.S. Northeast Airlines Flight 792 used DC3 equipment to fly between Berlin, NH and Laconia, NH. On the day of the crash, the plane was carrying four crew members and three passengers. All seven survived the crash, but while awaiting rescue two of the crew members died from their injuries. It wasn't until the morning of December 2nd that the survivors were spotted and rescued. A search of the Internet will yield reports containing more details of this crash. Click HERE for one such report. Visibility was near zero in the Berlin area on the day the plane crashed. On the day of my hike (24-May), visibility was also nearly zero at the higher elevations of my route. As I was driving down Success Pond Road to the trailhead, it was easy to see the low-lying clouds that had settled in over Mt. Success and other surrounding peaks in the area (photo below). However, all is not lost on days such as this. Although the view of distant vistas is blocked or obscured, there can still be some interesting sights. Shown below are some of the misty views that I experienced. My trek along the Success Trail was very pleasant. However, at about 1.4 miles into the hike there is a long section of rock slabs which I can easily imagine being challenging when conditions are wet and/or icy. And beyond the rock slabs there are sizeable sections of the trail with bog bridges which can also become quite slippery. However, these bog bridges are picturesque, at least in my opinion (next photo). At the end of the 2.4 mile Success Trail, I hung a right onto the Appalachian Trail for the final 0.6 mile scramble to the summit of Mt. Success. Just as a sidelight, for those who might be curious, this mountain was named for the township where it is located, i.e. Success, NH which was founded in 1773. This happens to be the same year that the colonists refused to allow importation of tea into Boston and also when the Stamp Act was repealed. It is speculated that one or both of those historical events is the origin of the name. Upon my arrival, Mt. Success was totally in the clouds, similar to the way it was on the day of the plane crash back in 1954. The next photo shows the ghostly image of the mountaintop cloaked in mist with the summit signs barely visible. Just as had happened earlier in the hike, the misty conditions provided some unique and picturesque views. The next photo is a scene that was captured just a few hundred feet from the summit. After lingering for awhile on the foggy summit, I continued westward on the Appalachian Trail for about 10 minutes and then hung a left onto a faint unmarked pathway that leads to the crash site. When I arrived at the site, there was such a mixture of thoughts. 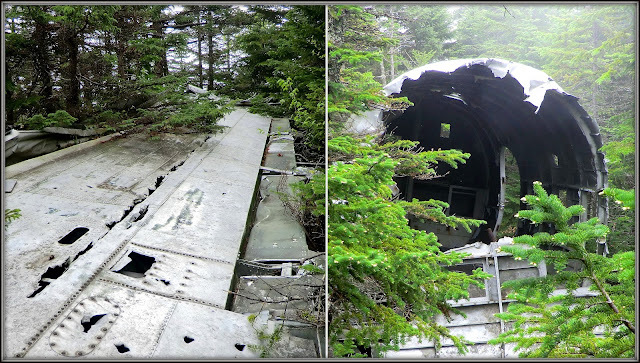 First of all, I was astonished to see sections of a large aircraft resting in a thick and remote forest. Seeing this rather tame man-made object intruding into the untamed world of Mother Nature was such a stark contrast. My thoughts then turned to the shock and horror that was surely experienced by the people who dragged themselves from the wreckage at the very spot where I was standing! The first objects to catch my attention were a wing, and a large section of the fuselage (next photo). My attention then turned to other parts of the aircraft which are scattered in a relatively small area. Shown below are few more photos of the wreckage. The visit to the crash site was a moving and interesting experience. Nonetheless, in the aftermath of all tragic events, life goes on. To memorialize this, I stopped at several points on my way back to the trailhead and photographed some of Mother Nature's smaller life-forms. 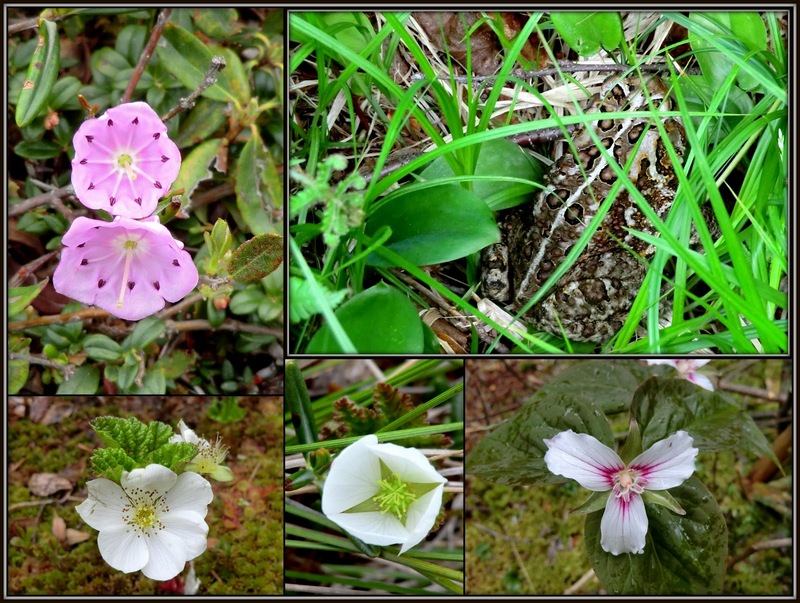 I'm talking about little things, such as wildflowers, and a lowly toad (look closely and you'll see it in the photo collage below)! To sum it up, this adventure ranks near the top of my most unforgettable hikes. It was quite an experience to not only witness such natural beauty on a misty day, but also to satisfy a morbid fascination with an event on another misty day nearly 60 years ago when a plane crashed on Mt. Success. 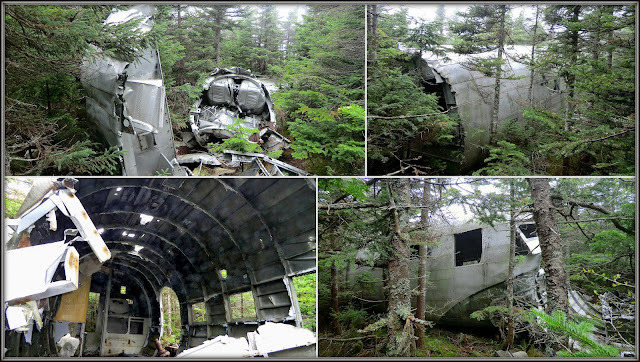 ADDENDUM (added 04-Sep-2012): It just came to my attention that there is a recently (2012) published book which contains a map and a description of how to access the DC-3 crash site. The book is authored by Kim Nilsen and it is entitled: "50 Hikes North of the White Mountains". Very interesting John. Have you gone to the crash site in Woodstock,NH? Hard to beleive there were flights of that size back then. Quite interesting, John! It does look somewhat similar to the Waternomee site, though the site in Woodstock does not have any parts large enough to walk into, as that large piece of fuselage seems to be. I remember quite a bit of old logging artifacts in the woods near that bog bridge area as well, if memory serves. Those are some great misty photos! Just shows that you never know what to expect, even on an overcast day! Well with the comments posted by you and Jim Salge relative to the Waternomee crash, you guys have really piqued my interest in visiting that site! Yes . . . misty days are fine with me! As I know you already know, they can sometimes provide some unique photo opportunities. Thank you for your kind remarks about the misty photos taken on this trip! Much appreciated! Thank you John, I have this one on my list. We came close to do it 2 weeks ago. Yvon . . . I think you and Annie will like this hike! I really enjoyed it, even on a misty day. On a clear day, the distant views should be spectacular! I want to go there John! Love history and mystery. Go for it, Dolores! If “history and mystery” is what you like, then this hike is certainly one to consider! Interesting tale, John! You cast the fog in a positive light as well. Nice job. Great write-up John. I love the misty photos. Seems fitting you visited the crash site with similar conditions. I visited it a couple Memorial weekends ago. It gives you an up close and personal perspective of how violent a plane crash can be. Quite moving. Thanks Joe for such insightful comments! It was totally unintended that my visit to the crash site was on a misty day. However, as you point out, it was somehow fitting that this visit occurred on a day with near zero visibility, just as it was on the day of the crash. Wow, John. Your pictures on this post are truly amazing. If I'm ever in your "neck of the woods", I'll have to visit this site, for both the beautiful mountain scenery and for my morbid fascination with plane crashes. I find it hard to believe that the fuselage of this plane is still relatively intact after almost 60 years—but then I guess there's not much that could decompose on an aircraft like this one. Great to read that you found this posting to be of interest, and that you loved the toad photo! We tried to get to this site this past spring,w/no avail.Too much ice.We'll be trying again on Nov 8th.We've been to the Woodstock wreck site and the Mt Belknap wreck site and hopefully find the others in NH.If you'd like to see pics of our explores you can on "Freaking AWESOME NEW ENGLAND" on Facebook. Thanks for reading my Blog and for making me aware of your Facebook page! Best wishes for ‘success’ at reaching the Mt. Success plane crash site on your next trek to this location. Thank you so much for your excellent blog! Your reports were very helpful for my friend and I last weekend as we did some last minute rearranging of our plans. I might be trying my hand (legs?) at finding the crash site this weekend. C.C. Hiker . . . many thanks for your kind words about my blog. It’s always very gratifying to learn that my reports have been helpful. Has anybody got the GPS to this site please..
We accompanied the niece of the stewardess who survived the crash to the site on August 19th, 2015. Unfortunately we made a wrong turn (we turned left) at the rock formation referred to as a "refrigerator or ice chest" and walked over an hour in the wrong direction. We should have turned right. For reference, it should take you no longer than 12 minutes from the rock formation to the crash site. Unfortunately, the log book was missing from the site. If you are reading this and plan to visit the site, please bring a new log book. “Adventures of a Yellowbird” by Robert W. Mudge. Published by Branden Press in 1969.